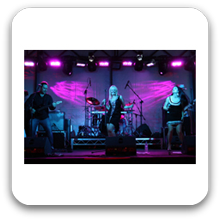 Sydney Band 365 are Sydney’s premier Corporate, Wedding, Parties and Function band fronted by two dynamic female vocalists and with also Male vocals and the cream of Australia’s finest musicians. Sydney Band 365 has set the benchmark in unadulterated fun with highest standard of playing everything “live”- no backing tracks or sequencers used! Their energy and enthusiasm mixed with great rapport with the crowd makes every show memorable; playing new millennium hits with a hint of classic funk, dance, disco, retro & rock thrown in the mix. Their huge set-list caters to a broad cross-section of audiences and guarantees to start the party on any occasion. Sydney Band 365 has done hundreds of Conferences, Weddings and Corporate Events and are a “no risk” investment to ensure your event is both professional and FUN. Sydney Band 365 are in demand regularly in the year for Corporate Christmas Parties, Sales Conferences, Weddings, Parties and most other special Occasions! Don’t hesitate to book early, as they guarantee a fabulous night that can take your event from adequate and “all right” to awesome and immensely satisfying for all the people involved – especially the nervous organisers. Sydney Band 365 are accomplished professionals with years of experience in corporate entertainment, and over 700 Corporate and Private clients, playing in Australia’s premier venues – you will not be disappointed and FUN with utmost professionalism is guaranteed! Can perform as a: 5, 6 Piece Band and are available to perform in Sydney and Surrounding Areas.